or Cyrano comes to Caracas. 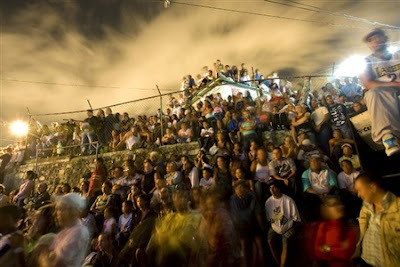 with the caption "People watch a movie premiere at the densely populated hillside neighborhood of 'Barrio'San Miguel in Caracas, Venezuela, February 25, 2008. The movie Cyrano de Fernandez is a hard-bitten version of the classic French play Cyrano de Bergerac set in a gun-plagued Venezuelan neighborhood. Hundreds of residents of the San Miguel 'Barrio' crammed alleys and rooftops to see the national premiere of the film, projected in a local ball court." i judge. hopefully not too harshly. unless it's deserved. Is Barack Obama the Messiah? How'd That Work Out For Ya? Jimmy Fallon to replace Conan? Diablo Cody Was A Stripper! We All Knew This Already, Right? Prediction: An Oscar Sweep for "Oscar Gold"
Semicolons; Do I Use Them Correctly? get a free web site hit counter here.